After working its way through the Knesset for years, Israel’s nation-state law, whose official title is Basic Law: Israel as the Nation-State of the Jewish People, finally passed on July 19 by a margin of 62 to 55 votes. Almost immediately, it was denounced in the strongest possible terms, and has continued to be denounced, by the political opposition at home, by the Palestinian Authority, and by a wide variety of observers abroad. In addition to such wholesale denunciations of the new law, critics at home and abroad have singled out specific clauses or allegedly hidden motives for special opprobrium. They have protested that in one key article, the law maliciously demotes Arabic from its former status as an official language of the state; that in another it expresses a lack of proper solicitude for the Jewish diaspora; that in yet another, contrarily, it expresses greater solicitude for the Jewish diaspora than for Israel’s own non-Jewish population, including, most insultingly, the Druze who loyally serve the state; and that in still another it offers a barely disguised brief for Jewish settlers in the disputed areas of the West Bank. More generally, some claim that, by egregiously omitting any reference to the principle of equality, the law subverts the very bedrock of civil liberty in a democratic society. What’s all the fuss about? At its core, Basic Law: Nation-State declares and defines Israel as the nation-state of the Jewish people and lists a number of specific manifestations of this definition, including Israel’s flag, anthem, calendar, language, connection to the Jewish diaspora, and immigration and settlement policies. All of these have long been central precepts in Zionist thought and practice. If they strike some as problematic, that is no doubt largely because of the law’s dual character: it is principally a law with concrete legal consequences but one that at the same time serves as a sort of mission statement for the state of Israel. Let’s begin by sketching the historical background of the new law and then proceed to review its content, explain its legal purposes, discuss its intended effects, and deal with its critics. To this day, Israel does not have a constitution; instead, it has an incomplete set of “Basic Laws” with quasi-constitutional status. These cover both structural matters (as in Basic Law: The Knesset, Basic Law: Government, and Basic Law: Judiciary) and substantive matters (as in Basic Law: Human Dignity and Freedom, and Basic Law: Freedom of Occupation). In 2003-2004, the Knesset’s Constitution and Law committee held a series of meetings chaired by MK Michael Eitan, the aim of which was to adapt and supplement these basic laws in order to construct and attempt to pass a complete constitution. During the discussions, two main points of contention emerged between left-leaning and right-leaning members of the committee; following the division within the basic laws themselves, one point of contention was structural, the other substantive. The structural point, ostensibly a mere procedural matter, involved the question of appropriate checks and balances between the judicial branch and the executive and legislative branches. The substantive point, which many thought would be the main stumbling block, involved the relationship between Israel’s character as a democratic state and its character as a Jewish one. To this day, Israel does not have a constitution; instead, it has an incomplete set of “Basic Laws” with quasi-constitutional status. As it turned out, however, reaching agreement on the procedural issue became virtually impossible, while reaching agreement on the substantive issue wasn’t all that difficult. In the case of the latter, a Knesset sub-committee was formed to prepare a draft constitutional chapter on Israel’s Jewish character, and one of us (Koppel) was given the task of negotiating an agreed text. 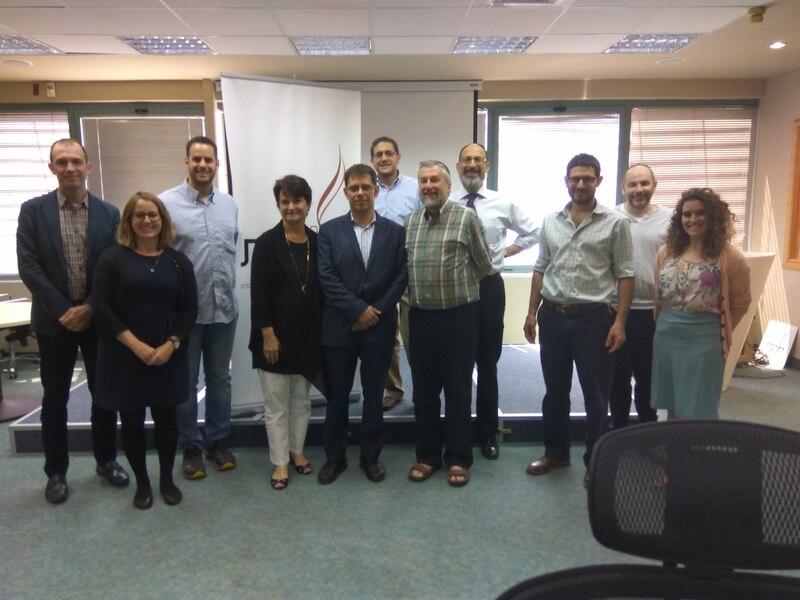 The two most engaged members of the sub-committee were the representative of the ḥaredi Yahadut Hatorah party and the representative of the anti-ḥaredi Shinui party. This made the prospects for agreement appear bleak. But in fact, and in defiance of common misperceptions, the differences were hardly insurmountable: the Ḥaredim didn’t demand lip service to a clerical state, and the secularists didn’t demand lip service to a secular republic. The remaining gaps were easily bridged. All sides agreed that Hebrew would be Israel’s main language and Arabic would enjoy a special status; that Israel’s flag, anthem, and emblem (the seven-branched menorah) would remain unchanged; that the Jewish calendar would be an official calendar and Shabbat the official day of rest, but that non-Jews could observe their own day of rest; and that Israel would maintain a special connection to Jews in the diaspora and would remain open to those who wished to return to their ancestral homeland. One telling interaction perfectly captured the flavor of the discussion. After debating whether Israel’s education system should include among its goals the transmission of Jewish “culture” (tarbut), as the secularist representative preferred, or Jewish “tradition” (masoret), as the ḥaredi representative preferred, both sides decided they could live with “heritage” (moreshet). In other words, so long as the discussion remained at a sufficiently high level of concreteness and a sufficiently low level of granularity, most problems could be resolved by creative wordsmithing. There was even broad consensus with regard to the proposed constitution’s chapter on human rights. If these major matters of principle were largely agreed upon, why did the constitutional moment pass without producing a consensual document? For one main reason: even while there was broad agreement that Israel should be defined as both a Jewish nation-state and a democracy with a full regimen of human and civil rights, the right and the left had conflicting fears about how this arrangement could go awry. Each could easily imagine situations in which the collective Jewish right to a nation-state would be in tension with the rights of individuals. (Thus, for example, giving substance to Shabbat as a day of rest could infringe the right to engage freely in commerce.) The left feared that the resolutions of these hard cases would limit liberty or equality; the right feared they would dilute the Jewish character of the state. The crucial issue was therefore the procedural one: who would be empowered to resolve these tensions between competing constitutional values? The right was willing to bet on the democratic process and wished to leave as much discretion as possible to the legislature. The left, contrasting the motley crew of parliamentarians—right and left, Ashkenazi and Sefardi, Jewish and Arab, secular, traditionalist, and ḥaredi—to the homogeneous lineup of Supreme Court justices—preponderantly secular, left-leaning, and Ashkenazi—decided to bet on the judicial branch, which it saw as more sympathetic to its preferences. In 1989, the Court upheld the Bedouin town of Segev Shalom in its refusal to lease land to a Jewish police officer. But in 2000 it ruled unconstitutional the Jewish Agency’s refusal to lease land in the Jewish communal settlement of Katzir to an Arab. In the Court’s view, while it was impermissible for Jews to discriminate in housing against Arabs, the reverse was acceptable. When over 130,000 Palestinian men exploited a loophole in the Citizenship Law to obtain residency rights and citizenship in Israel by marrying Israeli Arab women, the government made a temporary revision to the law that limited automatic citizenship on the basis of marriage to residents of countries and territories not currently belligerent to Israel. The Court upheld the revision by a razor-thin 6-5 majority but made clear that its approval was based solely on grounds of security and that it would strike down the revision if it were made permanent. The prospect of such judicial action hangs like a Damocles sword over Israel’s demographic calculus. The point is not that these outcomes were substantively problematic—in many cases they were not—but rather that the Court substituted its judgment for that of the legislature or executive, and always did so in the same political direction. This it accomplished by arrogating to itself the authority—never given it by law—to strike down government action on the basis of values and principles that the justices themselves divined from the ether, and by exploiting an asymmetry in Israel’s legal system. Which returns us to the structural problem, the problem of checks and balances that should have been easier to overcome but wasn’t. Until now, no Basic Law anchored the Jewish collective right to a nation-state. Thus, preserving Israel’s Jewish character was never even a matter that needed to be considered by the Court. The problem had its roots in the aggressive judicial activism of Aharon Barak, a Supreme Court justice from 1978 to 1995 and its chief justice from 1995 until 2006. Under Barak, the usual limits on whose petitions the Court could choose to hear (the matter of standing) and which cases it could choose to hear (the matter of justiciability) had been done away with. Barak unilaterally declared a “constitutional revolution,” according to which Israel’s existing Basic Laws, and particularly Basic Law: Human Dignity and Freedom, could serve as the basis for striking down ordinary statutes. That basic law, however, had been broadly worded and was almost devoid of specific content. To turn it into a tool for invalidating government action, Barak developed a mode of judicial interpretation that read those laws favored by the Court as broadly as possible and essentially ignored the text of laws that offended the justices’ ideological preferences. Finally, taking advantage of the dominating presence of already sitting Supreme Court justices in the appointments process for new ones, Barak stacked the Courtwith his disciples. The upshot: Israel had a Supreme Court that assumed its authority to use basic laws to strike down ordinary statutes and actions by government agencies. And as if that were not enough, the roster of basic laws suffered from a fundamental lacuna: there was no basic law anchoring the Jewish collective right to a nation-state. Thus, in all of the above examples, and in countless other similar cases, preserving Israel’s Jewish character was never even a matter that needed to be considered by the Court. This, then, was the situation prior to passage of the nation-state law, a situation exacerbated by, as we’ve seen, the failure of the constitutional initiative in the early 2000s to gain momentum. In the wake of that failure, no machinery existed to establish basic checks and balances on the Court’s authority, for instance by restoring standard limitations on standing and by removing already sitting justices from the judicial-appointments committee for new ones. The first version of the proposed Basic Law was introduced in the Knesset in 2011 by MK Avi Dichter, then of the centrist Kadima party, and was co-signed by 40 MKs, including 20 members of Kadima, several members of the Labor party, and Hamed Amar, then the only Druze member of the Knesset. The version that passed this July was very similar to the 2011 version, but with the three added provisions eliminated. What have the framers of the new basic law hoped to achieve by passing it? When justices consider how to interpret statutes concerned with Israel’s Jewish character, it is appropriate that they consider, among other legitimate desiderata, the need to preserve Israel’s character as the nation-state of the Jewish people. The new law confers on them both the obligation and the legal means to do so. The new law gives the Supreme Court the legal means to consider the need to preserve Israel’s character as the nation-state of the Jewish people. But this does not mean that Basic Law: Nation-State is intended in any way to regulate individuals’ lives. Quite the contrary; it primarily regulates government operations, not private action. Yes, like any law, the new one may entail some incidental restrictive consequences for the benefit of a common collective good. But that is no reason to keep matters of national character off the list of those collective goods that a polity can constitutionally seek to pursue. In this respect, the framers of the law trust elected representatives of the citizenry to do a better job of striking the right balance between collective and individual interests than have self-perpetuating elites in the judiciary. To be sure, judges who by dint of ideology and identity are unsympathetic to manifestations of nationalism will have little difficulty finding the interpretive tools to construe the new Basic Law in a way that allows them to reach precisely the same conclusions they would reach in its absence. But some judges will surely have the integrity to take the law seriously. Besides, the passage of a basic law with which some judges are unhappy could force a reconsideration of the exaggerated importance that the Court has attached to previous basic laws, using them to cast a pall over every statute and government decision. What originally made the basic laws basic was that they dealt with certain “basic” aspects of government: the composition of the Knesset, elections, and so forth. It was only in Barak’s judicial revolution that they would become broad fonts of unenumerated principles for striking down other legislation enacted by the same Knesset. If the new basic law encourages a bit of judicial modesty and newfound restraint, this, too, would be progress. Indeed, there are indications that such a reconsideration is under way. Left-wing legal scholars have recently engaged in frenzied efforts to find constitutional grounds for disqualifying Basic Law: Nation-State, itself now part of Israel’s constitution. So far they’ve appealed to a nebulous concept called “basic principles of the legal system,” to Israel’s Declaration of Independence, and even to the theoretical writings of American law professors and a decision of the supreme court of Bangladesh. Although, from our point of view, these scholars are looking in all the wrong places, in their own inchoate and perverse way they are trying to come to grips with the fact that judicial overreach has turned the basic laws into monsters, the dangers of which are now coming into clearer focus. In short, the new basic law is leading some on the left to argue that basic laws are not so basic after all; although it’s unlikely these jurists will apply that principle to the laws they like, the idea is now firmly out there. So much for what the framers hope to achieve by way of legal substance. As we mentioned earlier, a secondary purpose served by the new basic law is as a mission statement that defines which Jewish national purposes Israel can and should effectively serve. If we wish to teach our children that Israel is a Jewish nation-state, we need to define concretely what that entails. If we wish to demand from others that they live peacefully alongside us however we choose to define ourselves, we ought to flesh out that definition. This definition could not have been achieved in a non-binding declaration; an operational definition had to be made explicit in a law with some teeth. As a mission statement, the proposed law is as careful about what it doesn’t include as about what it does include. Based on the discussions described above, it seeks consensus across a broad range of Zionist Israelis. There is thus no mention of the chief rabbinate and no mention of religious legislation. The drafters have a more modest goal: the state should serve as a framework in which the majority of citizens already committed to some form of Jewish identity are able to manifest that collective identity in the public sphere. With this in mind, the law focuses on a broad consensual definition of Jewishness—one that focuses on Judaism as a civilization with its own language, symbols, calendar, holidays, sense of peoplehood, and territory. The fact that these consensual elements have drawn such fierce opposition only underlines the need for a clear and resolute statement of principles. Let’s therefore turn to the language of the law itself, restricting our own comments mainly to the provisions that have drawn the most fire. (a) The Land of Israel is the historical homeland of the Jewish people, in which the state of Israel was established. (b) The state of Israel is the nation-state of the Jewish people, in which it realizes its natural, cultural, religious, and historical right to self-determination. (c) The exercise of the right to national self-determination in the state of Israel is unique to the Jewish people. (a) The name of the state is Israel. (b) The state flag is white, with two light-blue stripes close to the edges, and a light-blue star of David in its center. (c) The state emblem is a seven-branched menorah with olive leaves on both sides and the word “Israel” at its base. (e) Details regarding the state symbols shall be determined by law. Jerusalem, complete and united, is the capital of Israel. The first clause of the law establishes not only that Israel is the nation-state of the Jewish people but that it is not the nation-state of any other people. This language has clearly sounded harsh to some ears, but in fact it is designed merely to block potential arguments that Israel is also the nation-state of a Palestinian people, thereby denying Jews any national home of their own. The second clause specifies that Israel’s flag, anthem, and symbol reflect its Jewish character. There should be nothing controversial about any of this. The entire notion of a nation-state is of a national body that, in its official and symbolic capacities, provides an outlet for and recognition of a particular character. The point of symbolic expressions of national purpose is precisely their unitary nature: national character is a corporate, collective property, and is not divisible. A country can have, for example, only one flag and one anthem. For Americans, the notion of a state as expressing a people’s self-determination may seem counterintuitive; their country was not established on such principles. But America is an exception, even among Western democracies. For some Americans and/or Canadians, the notion of a state as expressing a people’s self-determination may seem counterintuitive; their countries were not established on such principles. But America is an exception: many, if not most, Western democracies are nation-states that embody the majority people’s collective particularistic aspirations. Nor have such provisions ever been thought to conflict with equal rights for members of minority groups. The fact that Israel’s passage of such measures provokes controversy only demonstrates the ongoing need for the Jewish people firmly to assert their national rights both to the world and to themselves. (a) Hebrew is the state language. (b) The Arabic language has a special status in the state; arrangements regarding the use of Arabic in state institutions or vis-à-vis them will be set by law. (c) Nothing in this article shall affect the status given to the Arabic language before this law came into force. Note that the establishment of Hebrew as Israel’s national language does not limit individual rights. Unlike the constitutions of Spain and Quebec, both of which require the knowledge or teaching of the official language for all, Israel’s provision applies only to government operations. Next, the new law establishes Hebrew as the national language with a special status for Arabic; this is both a fair reflection of the status quo ante and more generous than the language policies of many Western democracies, most of which have only one national language—the primary one spoken in the country—even when there are substantial minorities with different native languages. Critics claim that the law “demotes” Arabic. This claim is refuted by the very text of the law, which explicitly guarantees the “status quo” of the Arab language. As it happens, the prior status of Arabic is somewhat ambiguous: until now, Israel has relied on a holdover provision from the British Mandate giving official status to Hebrew, Arabic, and English (the last-named being eliminated in 1949), and judicial decisions have generally pointed to some special status for Arabic, though not quite equal to Hebrew. In any event, the status of Arabic prior to passage of the law is exactly the status of Arabic after passage of the law. The state shall be open for Jewish immigration, and for the ingathering of the exiles. The reference in the second half of the sentence, from an ancient Hebrew formula, is to the legislation known colloquially as the Law of Return. This provision anchors in basic law the most fundamental principle of Zionism: that the state of Israel will always serve as a safe haven for all Jews, wherever they may be. The thorny issue of the definition of Jewishness for purposes of this provision is left to ordinary legislation. (a) The state shall strive to ensure the safety of members of the Jewish people and of its citizens who are in trouble or captivity due to their Jewishness or their citizenship. (b) The state shall act, in the diaspora, to preserve the ties between the state and members of the Jewish people. (c) The state shall act to preserve the cultural, historical, and religious heritage of the Jewish people among Jews in the diaspora. The nation-state law declares Israel’s ongoing solicitude for the Jewish diaspora; this is one of the foundations of Zionism, regarding which all Israelis are justifiably proud. As noted earlier, some Jewish spokesmen in the diaspora have objected that this provision is insufficiently solicitous, pointing to the late addition of the phrase “in the diaspora” in clause 6b. In fact, the phrase was added simply to prevent the undemocratic scenario in which all activity in Israel could be legally judged with an eye toward its perception abroad. Others have objected that the law is overly solicitous of Jews in the diaspora, presumably at the expense of Israel’s non-Jewish citizens. But such constitutional provisions are anodyne and appear in many Western liberal constitutions. For example, Article 2 of the Irish constitution states that “the Irish nation cherishes its special affinity with people of Irish ancestry living abroad.” Similarly, Slovenia’s constitution states that it “shall maintain concern for the autochthonous Slovene national minorities in neighboring countries.” Israel’s Basic Law: Nation-State is squarely in line with such provisions. The state views the development of Jewish settlement as a national value, and shall act to encourage and promote its establishment and strengthening. This provision has drawn the heaviest criticism. To grasp its purpose, we need to understand the current social and legal situation. Under current law as interpreted by the Court, Jews, as we saw above, can be legally prevented from leasing land in Arab towns but not the reverse. Moreover, in Jerusalem, the Palestinian Authority prescribes the death penalty for those Palestinians who sell land to Jews. The nation-state law does little to remedy this situation. It certainly does not authorize the creation of towns just for Jews. What, then, does the new law do? In Israel, most municipal infrastructure is provided, or at least subsidized, by the central government in Jerusalem. Because Jews and Arabs generally self-segregate by mutual preference, government subsidies to particular areas are effectively “marked.” The new law will thus allow the government to allocate subsidies that will “encourage . . . close settlement by Jews” (to borrow the language of the League of Nations Mandate for Palestine). Such settlement policies are necessary to prevent irredentism. In the words of Tzipi Livni, who happens to be one of the law’s biggest critics, “encouraging the development of the Negev and Galilee is an aim that crosses party lines and is a key element of the new Zionist vision.” Livni is obviously referring here to Jewish settlement, as the bulk of Israel’s Arab population already lives in those regions. Presumably, though not certainly, the law will make allocations that advance such national-security needs constitutionally possible. The Hebrew calendar is an official calendar of the state, and the secular calendar shall serve alongside it as an official calendar; the use of the Hebrew calendar and the secular calendar shall be determined by law. (a) Independence Day is the official national holiday of the state. (b) Memorial Day for the Fallen in Israel’s Wars, and the Holocaust Martyrs’ and Heroes’ Remembrance Day, are official memorial days of the state. The Sabbath and the Jewish holidays are the established days of rest in the state; non-Jews have the right to observe the days of rest on their days of Sabbath and holidays; details regarding this matter shall be determined by law. The use of the Jewish calendar for official purposes is not controversial. Ḥaredi representatives asked only that Israel’s Independence Day and Memorial Days, which their communities do not observe, be referred to as “official” holidays to distinguish them from traditional holidays. The Sabbath and Holidays clause is intended to anchor these in a basic law as days of rest so as to prevent constitutional challenges to the very concept of commercial restrictions on these days. The details are left for the legislature. One of the most common, but strangest, arguments against the basic law focuses on what’s not in it—namely, a provision guaranteeing equal rights to non-Jewish citizens. While most countries have unitary constitutions, the various elements of which are passed simultaneously, part of the basic-law process in Israel is that each issue is dealt with separately. The protection of individual rights is thus covered in Basic Law: Human Dignity and Freedom. The Court has already read equality into that law; if the legislature wishes to make equality explicit in that law—a risky proposition, as we shall soon see—it is perfectly free to do so. But equality would be relevant in Basic Law: Nation-State only if something in it compromised the equal rights of individuals; nothing does. Equality, furthermore, is a broad term of no specific definition, so slippery that there’s no knowing what you’re likely to get from invoking it. Would you have guessed, for example, that according to the doctrine of equality as derived by Israel’s judiciary from Basic Law: Human Dignity and Freedom, the Bedouin town of Rahat cannot maintain separate hours for men and women in its municipal swimming pool? Deputy Attorney General Dina Zilber has just informed the mayor of Rahat that this is the case. Moreover, judges have already declared that an explicit equality clause in a basic law would give them much greater leeway than even that. What would be the consequences of such a clause? Again, nobody knows. It could mean that restrictions on citizens of hostile regimes applying for citizenship in Israel on the basis of family reunification are unconstitutional—or it could not. It could mean that gender-separated classes in a ḥaredi college are unconstitutional—or not. Despite what some have suggested, the inclusion of an equality clause would not actually have addressed the Druze objection. Enthusiastic supporters of such an added provision would therefore be well advised to be careful what they wish for. The Supreme Court has already invalidated, on equality grounds, draft legislation excusing Ḥaredim from Israel’s military draft; it could read an explicit equality provision in the new Basic Law as authorization to invalidate the even broader draft exception for Arabs, which to many might seem glaringly at odds with equality. On the other side of the spectrum, many Israeli Druze have objected to Basic Law: Nation-State on the grounds that their loyalty to the state and their service in the army are given no special recognition. Perhaps this objection could have been anticipated and handled more effectively in the rollout of the law. But it is important to note that, despite what some have suggested, the inclusion of an equality clause would not have addressed the Druze objection. Quite the contrary: an equality clause might well render unconstitutional any such preferential recognition for Druze, and conceivably any special benefits for veterans altogether. In sum, simply including the word “equality” does not resolve important questions. At best, it functions as a feel-good signal of virtue and righteousness that utterly ignores how feel-good language in a law is liable to have feel-bad consequences in practice. At worst, in Israel it would just delegate those important questions to the unfettered whims of an activist Supreme Court, which could use a vague equality provision to strike down any law or government action it didn’t like on grounds of unequal consequences. Nor would it be unreasonable to conclude that this is the real agenda behind the push to add an equality provision to the new basic law. To put it straightforwardly: although we strongly support equality of individuals before the law, we are not prepared to hand an activist and politically-biased Court a blank check to complete its takeover of Israel’s political system. Basic Law: Nation-State gives constitutional force to the fundamental principles of Zionism. It does so without imposing duties on or denying rights to any individuals. It is consistent with similar provisions found in other Western nation-states. The need for anchoring these principles in a basic law has grown ever more urgent as Israel’s Supreme Court has slowly but surely endeavored to erode Israel’s Jewish character, an endeavor abetted in part by the absence of just such a basic law. The need for this law is made further manifest by the continuing opposition to the very idea of a Jewish nation-state. We have in mind not those advocates of national self-determination for everyone on earth—first and foremost the Palestinians—with the single exception of the Jews; bigotry of this order deserves no response. Rather, we have in mind those, in Israel and in the diaspora, who call themselves Zionists, and for whom the content of this law would have been entirely consensual less than a generation ago, but who now find themselves bothered by it for reasons they appear to have trouble articulating—hence the frenetic and sometimes self-contradictory striking out at one thing after another. Indeed, many of the very same members of the Knesset who co-sponsored a more robust version of this bill in 2011 suddenly claim to be horrified by its weaker version. One such co-sponsor, MK Hamed Amar, is now petitioning the Supreme Court to strike the new law down. One could get the impression that those not engaged in cynical political opportunism have been swept up in the tides of elite anti-nationalist sentiment and now simply find this law “too Jewish” for their taste. Basic Law: Nation-State was written, promoted, and passed by those who remain firm in their commitment to a Jewish nation-state and to individual freedom. We believe their resolve will not go unrewarded. A decade or two from now, when the political dust has settled, the passage of Basic Law: Nation-State will be regarded as a seminal moment in Israel’s maturation both as the national home of the Jewish people and as a beacon of liberty. This article was originally published in Mosaic.